If the computer where DiskSorter Server is installed on is connected to the Internet, login to the DiskSorter server (default user name and password: admin/admin) using a standard web browser, click on the 'About' link located on the top menu bar, press the 'Register' button, enter your name or your company name, enter the received unlock key and press the 'Register' button. 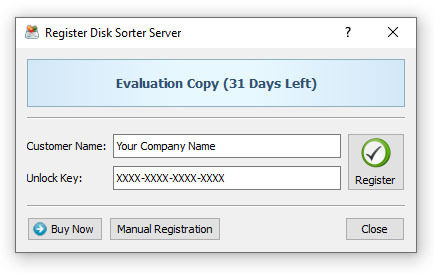 If the computer is not connected to the Internet, press the 'Manual Registration' button, export the product ID file and send the product ID file to register@disksorter.com as an attachment. Within a couple of hours, you will receive an unlock file, which should be imported in order to finish the registration procedure.